Great Western Containers offers steel pails in varying sizes and gauges of steel in open head and tight head configurations. Ideal for paints, chemicals, asphalt, roofing materials, etc., our pails are available in a wide range of UN ratings and are inventoried at all of our Great Western Containers locations. We’re proud to stock steel pails exclusively from Phoenix Containers – a solid manufacturer committed to the same continuous improvement of quality and efficiencies that we are at Great Western Containers. Their modern operation features state of the art lithography equipment that allows for your unique pail printing and design. We stock open head pails from 10 litre to 5 imperial gallons, and 20 litre tight head pails. Other sizes are available on special order. 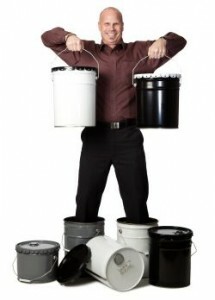 Measurement All pails are 11.25″ diameter for consistent lid applications.